Reconstruction lasted until 1877, and many referred to the period as merely a continuation of the Civil War itself, not necessarily because of feuds and racism, but because many Southern communities had lost nearly all able-bodied males over 18, leaving a vacuum in the workplace and a void in the traditional family. 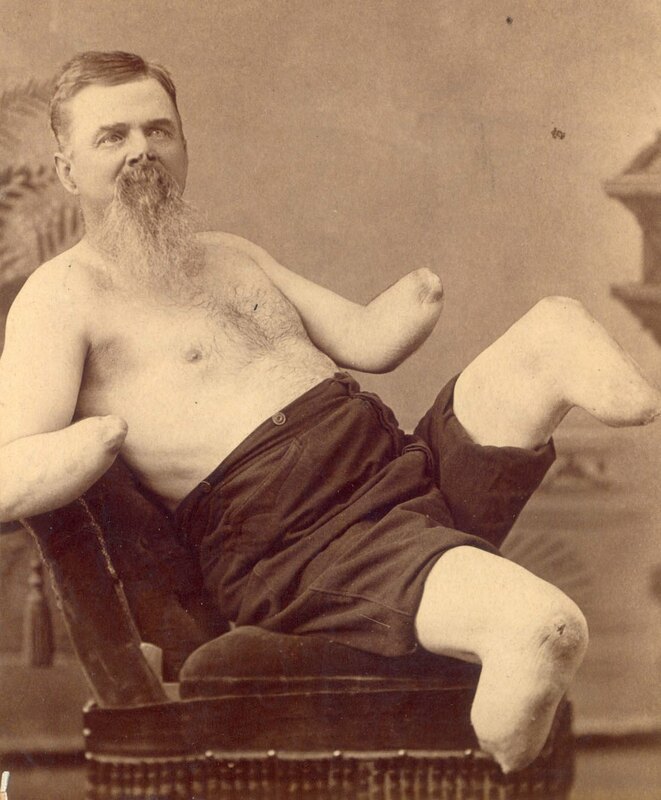 The Civil War had witnessed unprecedented loss of life, but the magnitude of soldiers returning home with diseases and wounds was equally unfathomable. Reconstruction? What a daunting task they confronted. While families were uncertain about life, others were enjoying the consternation for personal gain and political favors. Although Reconstruction meant rebuilding, it happened during an era absent of social security and veterans affairs, so to live and eat was synonymous with teamwork and community effort (notice the word "unity" in community). Post traumatic stress disorder, battle fatigue and shell shock, and other disorders and mental diseases, were not recognized at the time and neither were there any treatments. Everyone, everyday, had personal battles of their own, such as having food to eat, and enduring the physical and emotional traumas associated with the costly Civil War, and the majority of the nation cared little about Reconstruction and Civil Rights Acts. So on the national political front, it too was a battlefield as individuals maneuvered and fought for rights and equality. Reconstruction was indeed a continuation of Civil War. 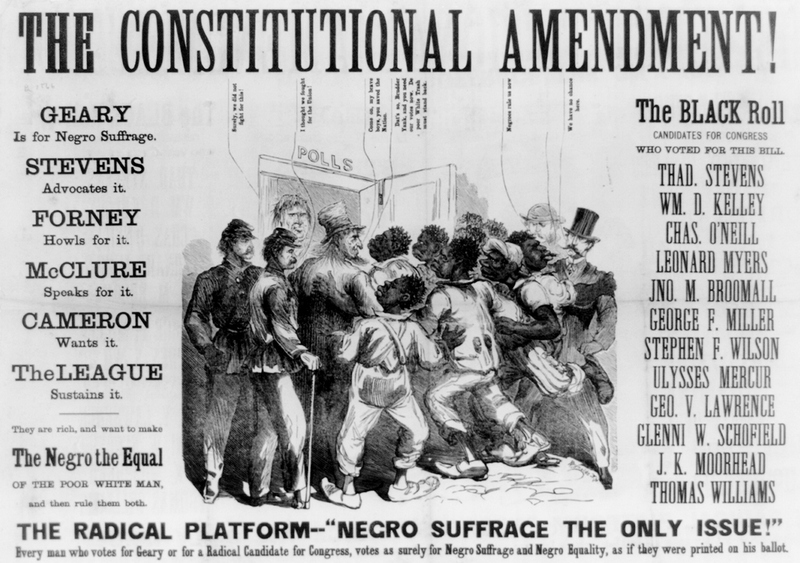 (About) This 1866 political cartoon, distributed by a white-supremacist candidate, declared that Republicans sought to grant suffrage to black men in order to create a voting bloc for themselves. Detractors of the campaign for full black male suffrage were attempting to discredit abolitionist Representative Thaddeus Stevens of Pennsylvania and others. The Civil Rights Act of 1866: This act granted black citizens equal rights to contract, to sue and be sued, to marry, travel, and own property. It made all citizens subject to "like punishment, pains and penalties." Any person guilty of depriving citizens of their stated rights because of race, color, or previous condition of servitude could be fined, imprisoned or both. The Reconstruction Act of 1867: This act allowed former slaves to participate fully in the political arena. As a result, African Americans sat in constitutional conventions, helped draft state constitutions, and supported new comprehensive programs for state education in the South. The Enforcement Act of 1870: This act stated that all citizens otherwise qualified to vote in any election should not be denied the vote because of race. States could set up prerequisites for voting, but all persons were to have equal access to the vote. The Civil Rights Act of 1871: This act set up a system of federal supervision of elections within the states in order to stop illegal voter registration practices. The Ku Klux Klan Act of 1871: This act was intended to protect black citizens against intimidation by illegal action, such as by the KKK, in cases where states could not, or would not, provide protection. The Civil Rights Act of 1875: This act entitled all persons the "full and equal enjoyment" of public accommodations, such as hotels, transportation or theaters. It granted blacks the right to sue for personal damages, and allowed any qualified person to serve as a juror. This was the last piece of civil rights legislation passed by the United States Congress until 1957. (About) Pvt. Benjamin Franklin, Company H, 2nd Minnesota Regiment Cavalry. As soldiers lay dying all around them and others awaited attention – some screaming, some in shocked silence – the surgeons in blood-splattered clothes went to work, sawing through bone. Their task was to sever the pulverized limbs and shattered bones of those who had been hit by deadly bullets shot from the barrels of rifled muskets. Amputations conducted on such a large scale had never been seen before. Foner initially describes the African-American experience during the Civil War and Reconstruction. He argues that African-Americans were not simply figures that took little or no action in the events of the day, and notes the enlistment of thousands of African-Americans in the Union army during the war. Foner also notes that many of the African-Americans that eventually became civil leaders had at one time served in the Union Army. He states, "For men of talent and ambition, the army flung open a door to advancement and respectability." He notes that as reconstruction progressed, African-Americans were the targets of violence and racism. Foner believes that the transition of slaves into free laborers and equal citizens was the most drastic example of change following the end of the war. He notes how African-Americans were eventually forced to return to the plantations, not as slaves but as share croppers, and were thus introduced to a new form of slavery. He argues that this arrangement introduced a new class structure to the South, and states "It was an economic transformation that would culminate, long after the end of Reconstruction, in the consolidation of a rural proletariat composed of a new owning class of planters and merchants, itself subordinate to Northern financiers and industrialists.” The author illustrates how both blacks and whites struggled to use the state and local governments to develop their own interests and establish their respective place in the evolving social orders. Another theme that he addresses in this excellent study is racism itself and the interconnection of race and class in the South.